K lives just one block away from this place and every time we go in and out of his house, we smell their delicious Korean BBQ. I’m always conflicted when we’re about to leave for another restaurant because I catch the smell of their juicy Kalbi ribs. The place gets super packed, but oddly enough, we got a table for 6 right away last time we came. Make sure you wear old clothes because you’ll smell like Korean food when you leave. Service is lacking, however. They turned me away once since I came at 9 and they closed at 9:30. They also forget to give you some of the free items such as the soup or the fried fish. What’s great at Korean restaurants is the plethora of appetizers. You have the kimchi, pickled turnips, cucumbers, anchovies, fish cake, bean sprouts as well as kimchi tofu soup or a fried fish. I think the rule of thumb at this (and most) Korean restaurants is if you order soup, you get a fried fish; if you don’t order soup, you get the house tofu soup. Shin Toe Bul Yi does give seconds on the mini trays of appetizers – major plus in my book since I can’t get enough of that fish cake. 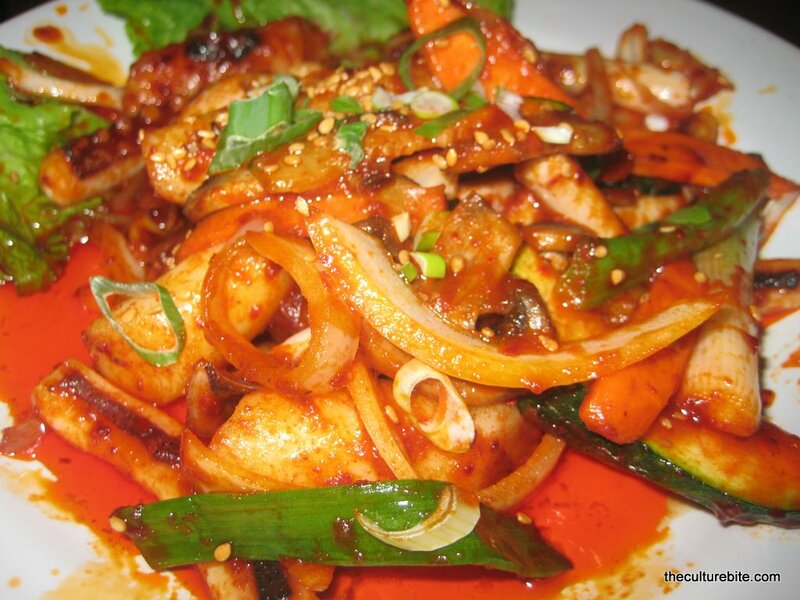 Calamari Bok (sautéed rice cake, calamari and vegetables in spicy sauce) – This is my faaaavorite dish at this restaurant. It’s made with 4-5” pieces of the chewy rice cake sautéed in a sweet and spicy sauce. I’m not big on calamari though, so I ate around it. Pork Bul-Go-Gi (broiled lean pork marinated in spicy sauce) – This is K’s favorite dish. The thin slices of pork are marinated in the same sweet and spicy sauce. The meat is very tender and has great flavor. The only thing that worries me about this dish is the bright red color; it doesn’t seem natural. Kal Bi (beef short rib marinated in house special sauce) – Koreans make some dang good short ribs. I just love their marinade. It’s sweet, salty and spicy. This Kal Bi was much meatier than other Korean short ribs. Usually, a majority of the pieces are just fat and bones. Chicken Small Pieces (deep fried) – Last but not least is the fried chicken – hands down, the most popular dish at the restaurant. It’s not your typical fried chicken that you get at KFC or Popeyes. The chicken is very crispy. I’m pretty sure they use cornstarch rather than flour for their batter. The cornstarch brings the crunchiness to a whole other level. After the chicken has been deep fried, it’s sprinkled with a spicy powder. One time I came here, we had a ton of chicken left over and I accidentally dropped 3 pieces on the floor when boxing it up. I was SO devastated!